Good. Butter. Better | About Fat and Food-Enthusiasm. My family has a new holiday tradition: Hipster Easter. It didn’t involve satiric chocolate bunnies, over-sized glasses with pastel frames or “alternative” Easter carols (those exist, right?). Hipster Easter did include the idea that “forks are too mainstream” (trust me, I wish I was kidding) and 2 loaves of religious irony. My immediate family is not very religious. We loosely observe Christmas and Easter, but I prefer trees and chocolate to holy scripture. 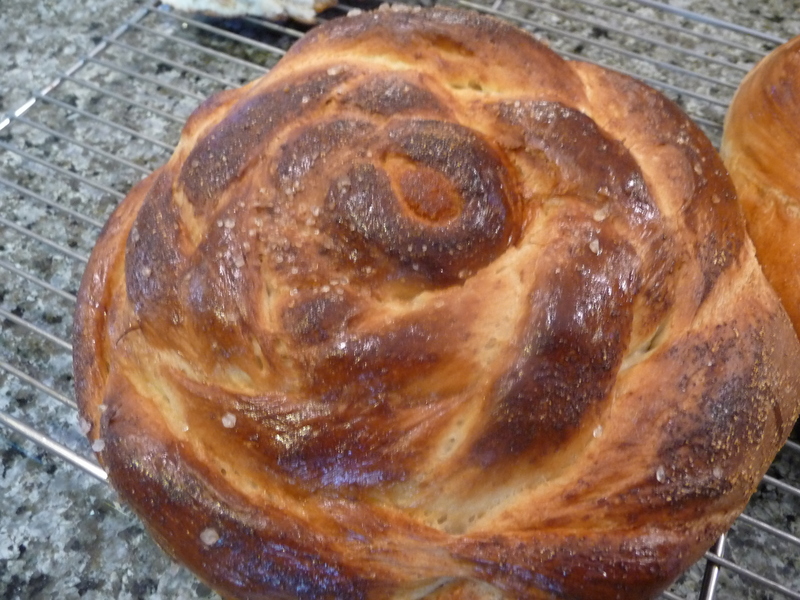 So when my godmother asked me to bake bread to bring to Easter Supper, I emailed my friend asking for the only bread recipe I knew I could successfully execute: Challah. I realize this is a Jewish bread, I realize that it’s Passover and Jewish people are not eating leavening agents and I’m bringing it on Easter Sunday. I’m aware of all of this. Some people have faith in a higher power, I have faith in the healing power of delicious food. 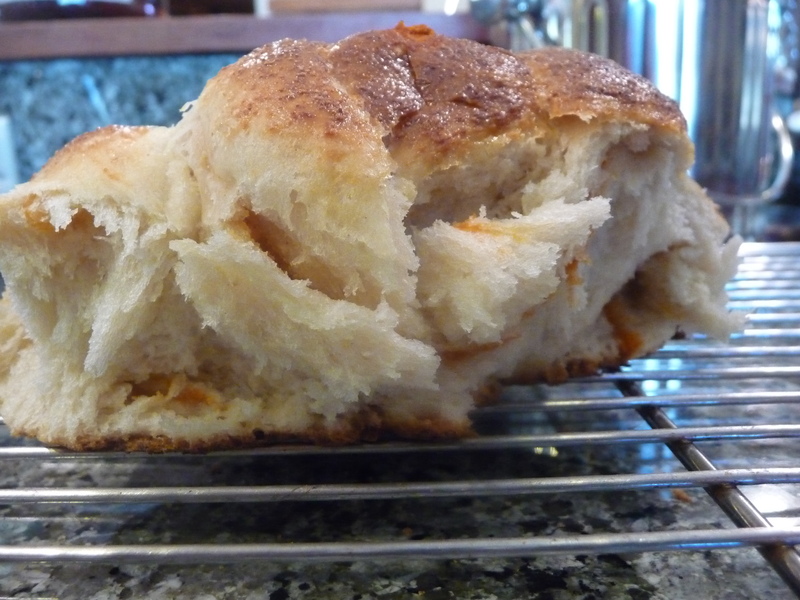 Challah in all its moist, crusty, cakey goodness is the epitome of bomb (dot) com. 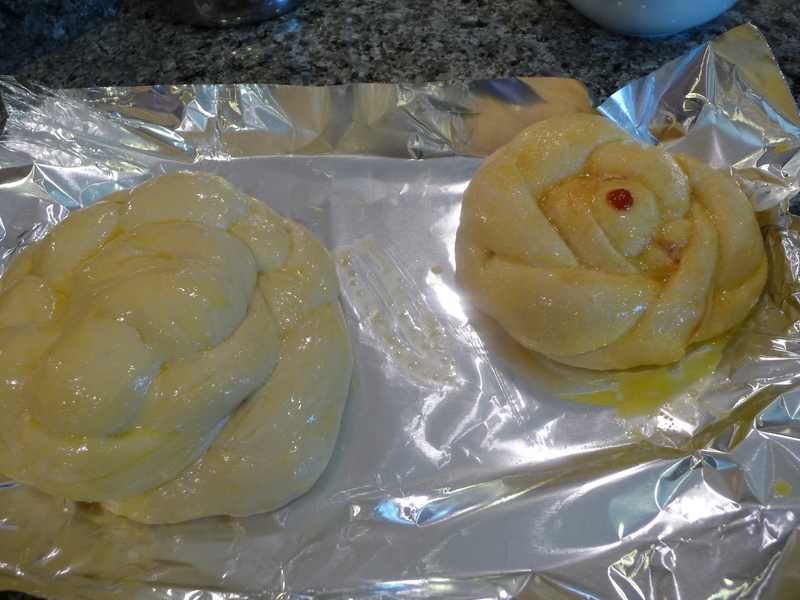 Challah braided with Sriracha and garlic powder…..
On second hand, maybe I’m more religious than I thought. 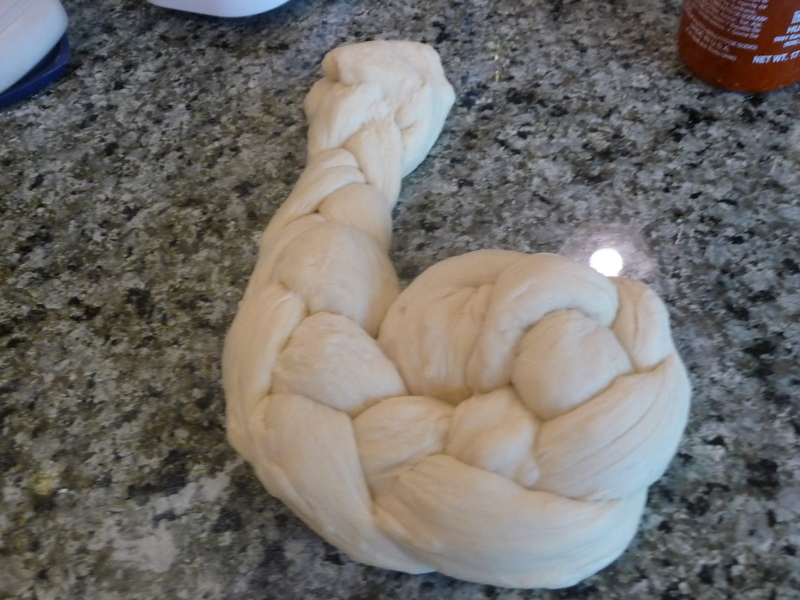 This recipe was generously provided by the Emory University Chapter of Challah For Hunger. It’s their base recipe to which they add a variety of toppings including pesto, cinnamon sugar, nutella! and my personal favorite: chocolate chips. -Mix the sugar, oil, salt, and water in a large bowl until everything’s dissolved. -Add 3 cups flour and mix. You will not necessarily be able to get rid of all the clumps of flour yet; that’s okay. 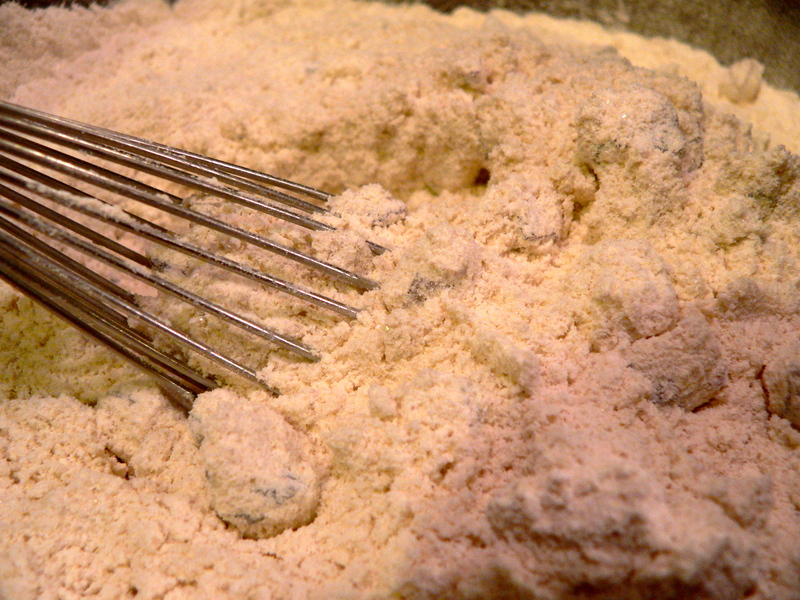 -In a separate, small bowl, combine 1 tablespoon INSTANT yeast with one cup of flour. After the yeast has been thoroughly mixed into the cup of flour, add the mixture to the dough to make a total of 4c flour. -Continue adding flour (I switched from a whisk to a wooden spoon here). As your mixture becomes more solid, at around 5.5 cups, add the flour more and more gradually. 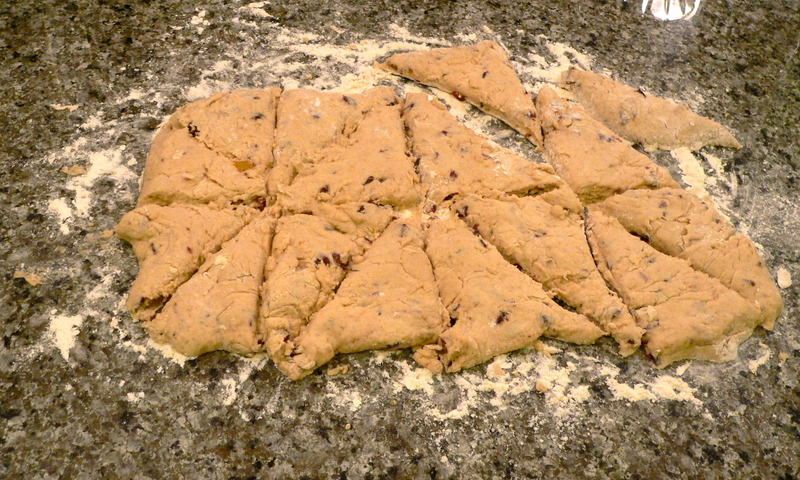 Add flour until you reach the point when, if you press the dough gently with clean fingers, no dough sticks to your hands. It should be around 6.5 to 7 cups when this happens. 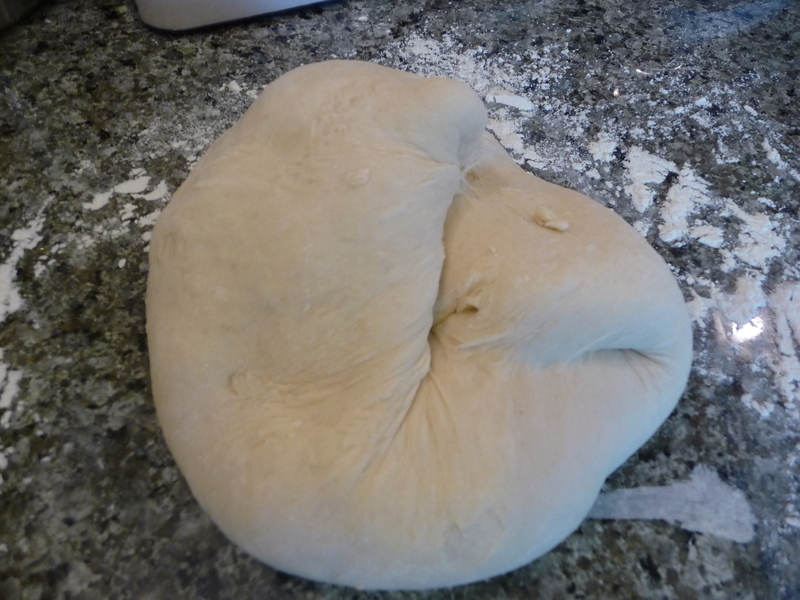 -Let the dough rest for 10 minutes. Take a break! 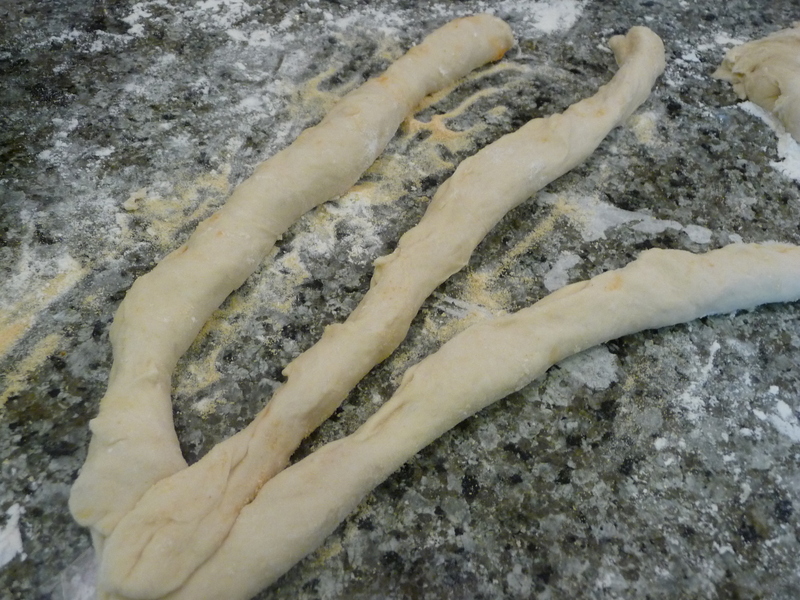 Then knead (using the heel of your hand, not your fingers) for 3 minutes. You may have to add some flour while kneading, but be conservative. 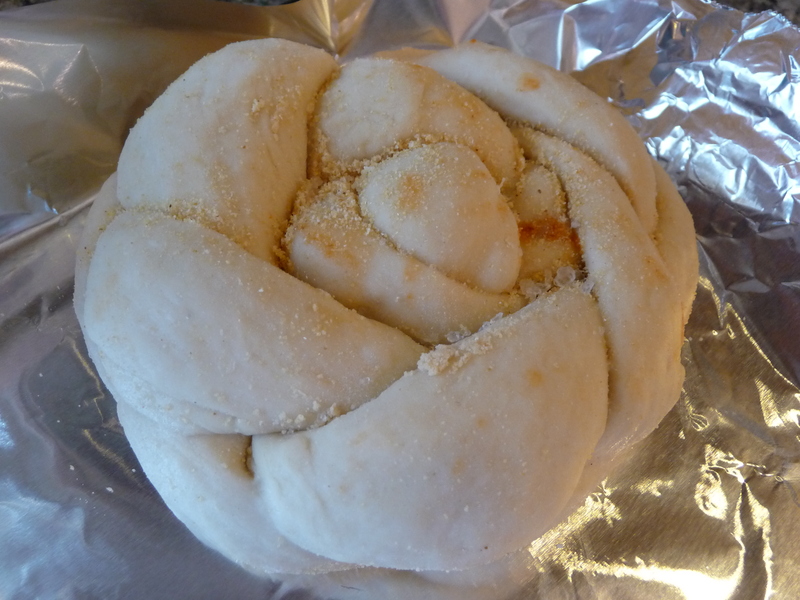 -Divide dough in half (or quarters, depending on how large of a loaf you want). 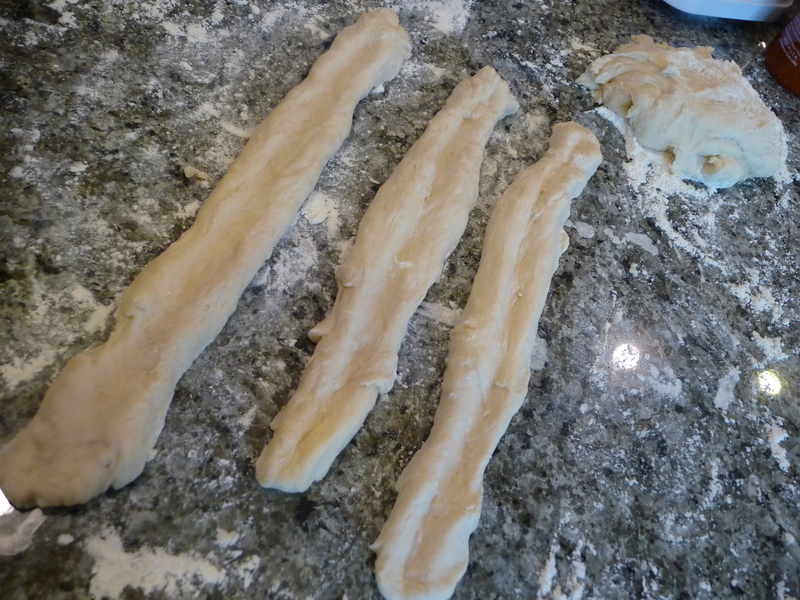 -Divide each chunk into three pieces. Stretch/Pull/Roll each strand out until about the size of a ruler. Make sure the “strands” are roughly the same size. -Create a small indentation down the middle of each strand. This is where the filling will be placed. 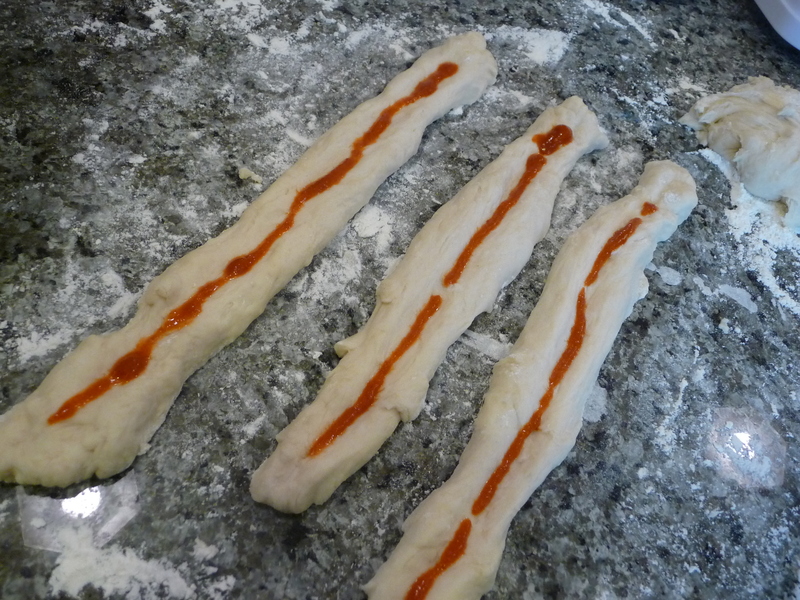 -For Sriracha garlic: add a thin (like the width of a piece of yarn, it gets spicy quickly) line of Sriracha down the middle of each strand and then sprinkle generously with garlic powder. 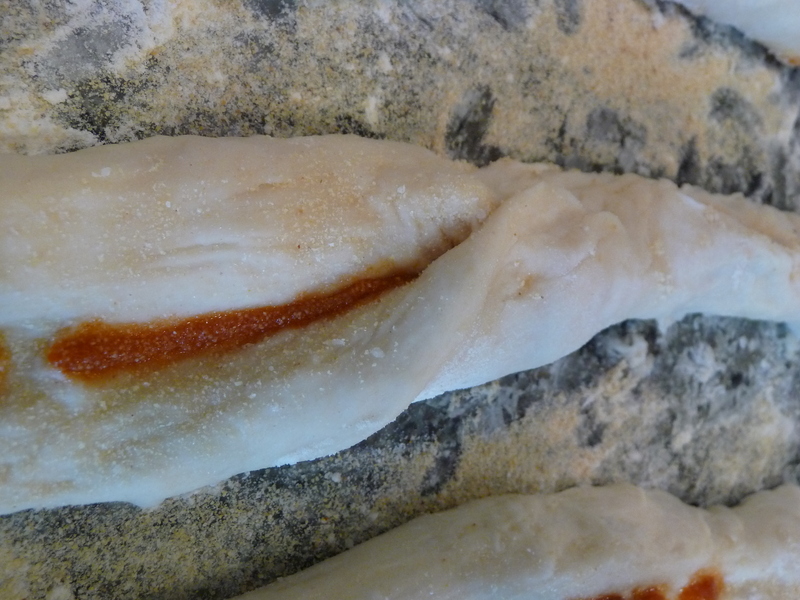 After you’ve placed the filling, pull from underneath the dough and pinch to seal the filling inside the strand. -Braid the strand. 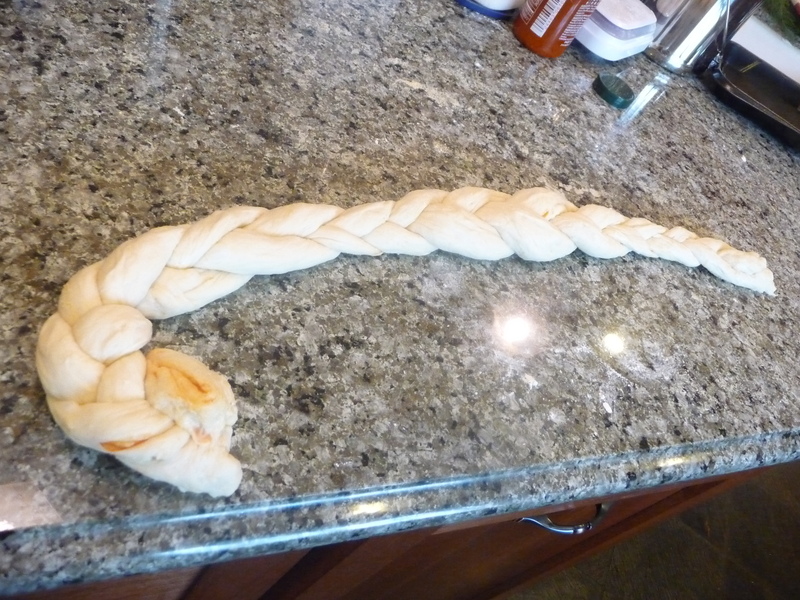 Once braided, roll the braid underneath itself to make a small circle. Place on the baking pan and let loaves rise for one hour. -For decoration and identification, add garlic powder and some salt to the top of the loaf, and a tiny dollop of sriracha. Brush the top of the loaf with egg wash if you’d like a shiny crust, however, it’s not necessary. -Bake at 350 until golden brown. 30-35 minutes for smaller loaves, 35-40 for large ones. It will sound hollow and look lovely golden brown on the top. Yes, this is a little bit labor intensive, but it’s not difficult. 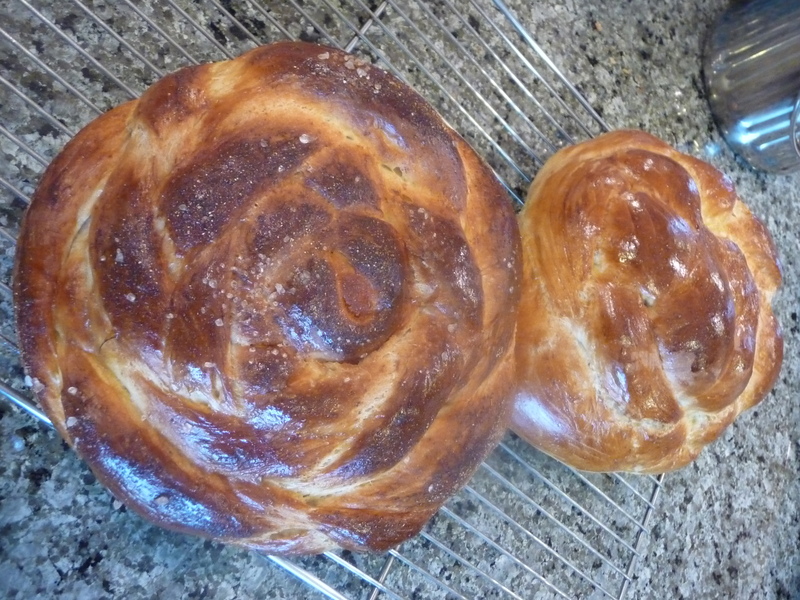 Challah is a delicious way to spend an afternoon getting your hands messy. Additionally, it makes supercalifragalisticly awesome french toast the next day. 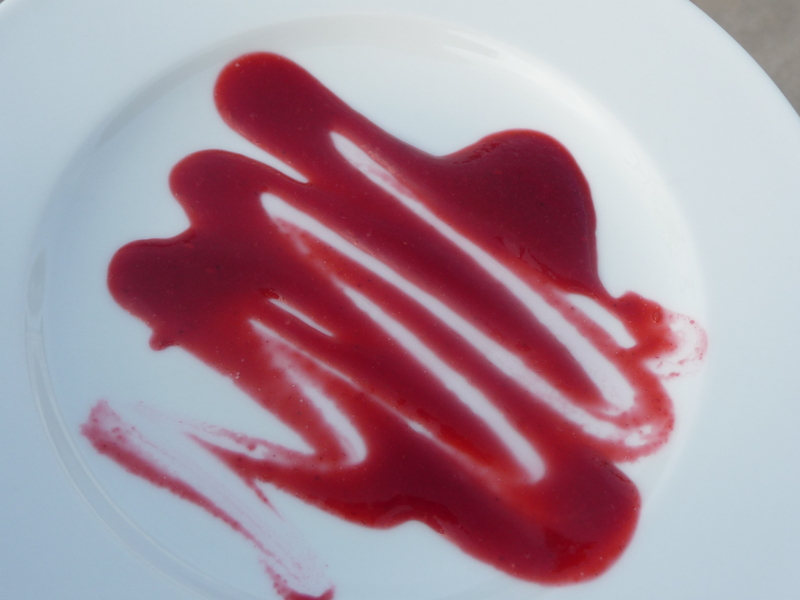 Did you know that Coulis is french for “runny jam”? There are several culinary thing-a-ma-jigs I’ve encountered that sound like, OMgosh, so impressive, but…(bursting the bubble) they aren’t. This sauce took less than 5 minutes (including the dishes!) and is essentially what happens when raspberries grow in a meadow with unicorns and rainbows and somebody brilliant wanted to make them into a sauce. True story: When the Greek Gods were sittin’ pretty, drinking “ambrosia”, they were really dousing the fires of their immortal bellies with this stuff. It’s that good. Also……I know that I have been suspiciously absent from the wonderful foodtopia that is GBB. It doesn’t mean I haven’t been working on things to share! Trust me, there is about to be a contentsplosian that will blow your mind. -Let the raspberries thaw, no worries if they are still a little bit frozen. -Pour the contents of the blender through a fine mesh sieve to remove all the seeds. This stuff is delicious on Greek yogurt in the morning (look at you, so healthy!) or cake and ice cream at night. Also….spread it on turkey sandwiches (I’m fully aware it sounds weird). 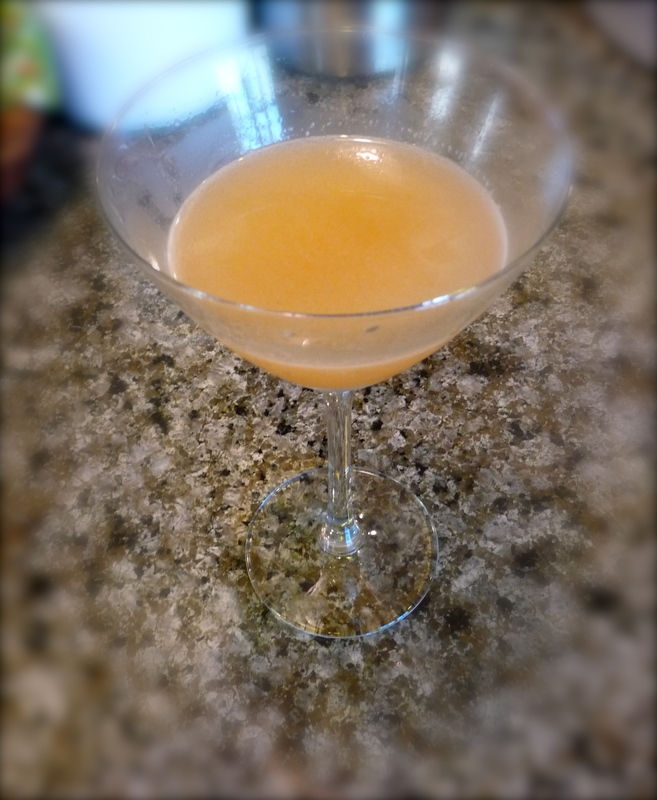 This was supposed to be a baking blog with the occasional cocktail. I’m unsure if the current reversal is due to the fact I feel compelled to post every Wednesday because I love alliteration or lately, I’ve enjoyed ingesting my calories alcoholically (I have no idea if that’s a real word). I have no fun cocktail with a super cute name. I have real world issues this week including midterms, papers, midterms, papers, job applications and preparing to leave town for a week (gearing up for Spring Break is hard, guys) so…….. Consider the ball officially dropped. If you are super desperate for some sort of inebriation, might I recommend a beer? They are nice, cold, and mellow. Perfect for drinking on those days where it is important to make mature life decisions (ie. studying for midterms, writing papers and filling out job applications, printing out boarding passes before the line at the airport, etc.). Though now I think about it, “Mature Life Decision Monday” has a much better ring to it…..
Full disclosure: I’ve got a really nice daytime buzz going on right now. 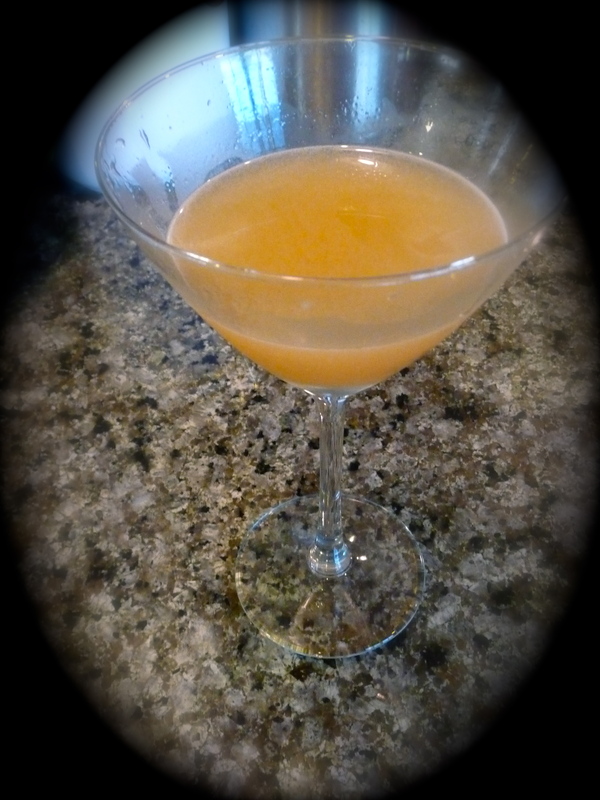 I invited a friend over and we played mixologist. My junior year of high school, I was in a Chemistry lab group with three people. One girl weighed everything, took notes, generally made sure that we were on track. I’m pretty sure she ended up with like a 99%. She’s at Brown…slacker. The token dude set things on fire. I have no idea where he ended up. I poured things. 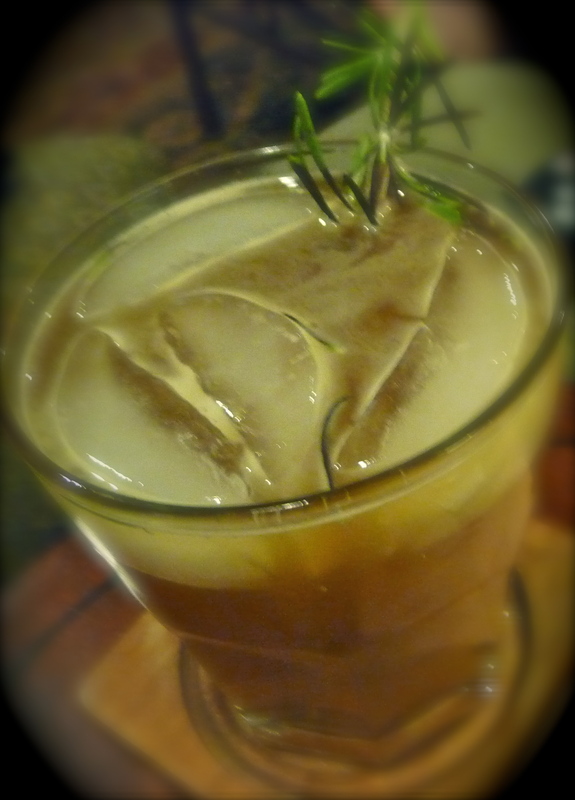 As pretentious as the term “mixology” is, I really like being able to imbibe my current lab projects. Not having to turn in a report for a grade? Icing on the cake. Olive in the martini glass? Little umbrella in the daquiri? Ehhh…….I’ll work on it. Also, this drink is f#@king delicious. Just go make it. It’s bright, zingy, strong, and did I mention it’s delicious??? -Strain (we ended up doing this twice) and Serve. I like to lose myself in baking. It’s an amazing feeling to take a bunch of powders and liquids and mix them together to make something cakey, crumbly and perfect. It’s somewhere between therapy and some sort of creation high. I bake when I’m happy and have several hours to kill. I bake when I’m stressed, angry, volatile and feel like screaming. I bake when people are born, when people get sick, when they pass. It’s the place I go to when I’m unsure of what else to do. And it is a wonderful place to be. When my little sister was 7 years old, she had a sophisticated palate. After years of chicken tenders and Kraft Mac n’ Cheese, she suddenly announced at the dinner table that her “bitters had come in”. She now loved to eat strong cheeses (smoked Gouda, anyone? 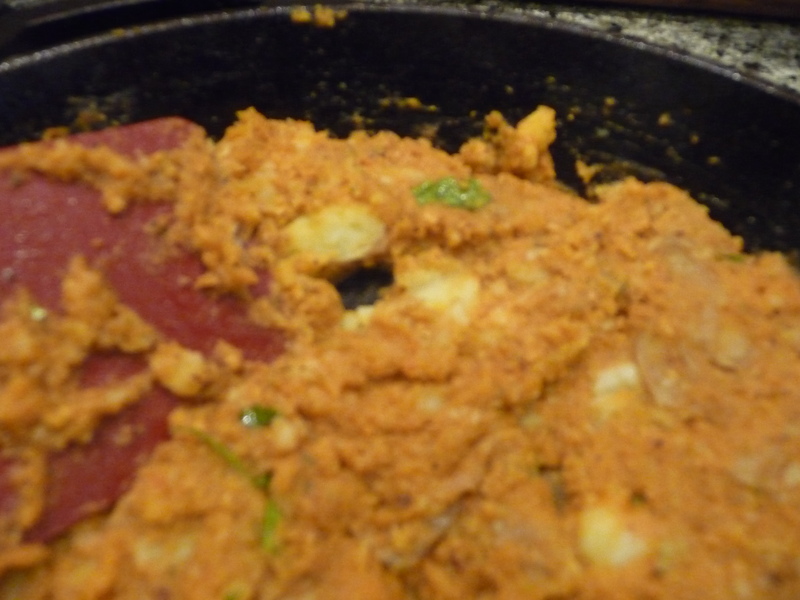 ), vegetables, spicy food. It was impressive. And daunting. I loved chicken tenders too much to evolve. I spent years of my life stuffing candy corn into my face. I used to L-O-V-E sweet to the power of sweet squared. But…. (and I hate to admit I’m growing up) 21 years into my maturity, my bitters finally came in. Lately, I like things seasoned. I don’t mean sprinkled with Cajun salt (although that sh#t is delicious). 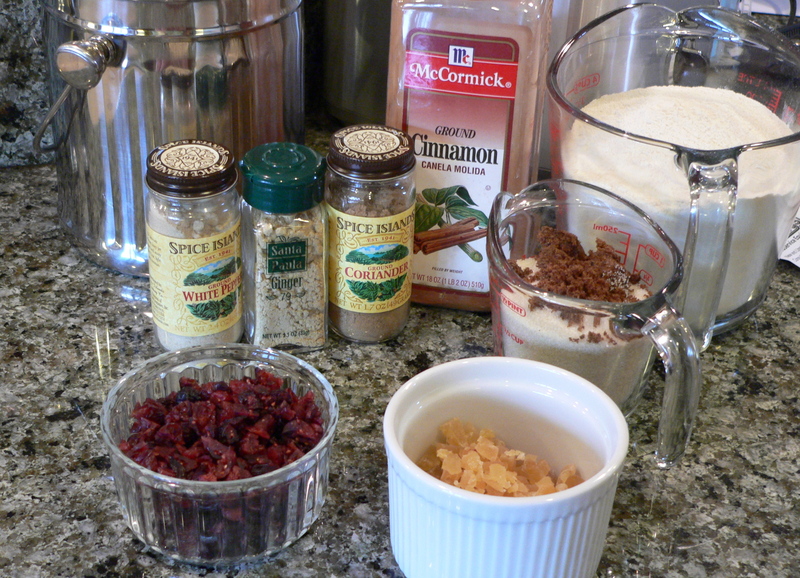 I want deserts a little spicy, surprisingly savory, like chocolate with chili and cinnamon. My favorite spice so far? Coriander. It’s magical. Especially when it’s mixed with Ginger, Vanilla Beans and a little bit of White Pepper (I know this sounds crazy, but try it!!). Insert Scones, aka the Most Perfect of Breakfast Pastries. The perfect thing to house my need for a “spice cabinet in a desert” syndrome. And yes, that’s a real disease. I WebMD‘d it. 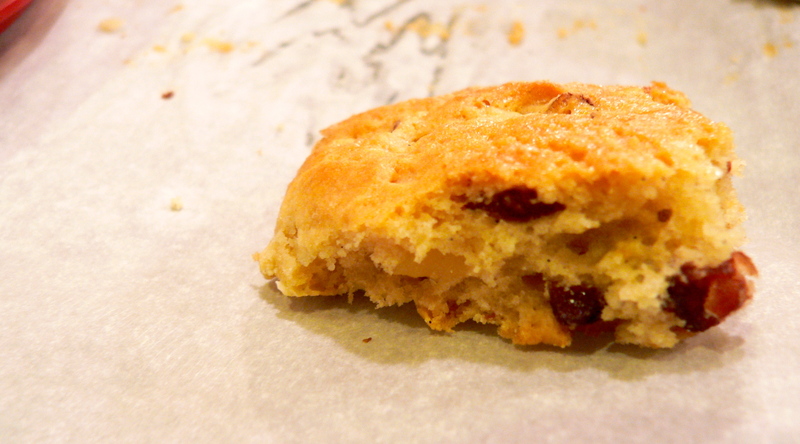 These scones are healthy(ish), light, a bit savory, and really delicious with homemade butter (see the theme here?). 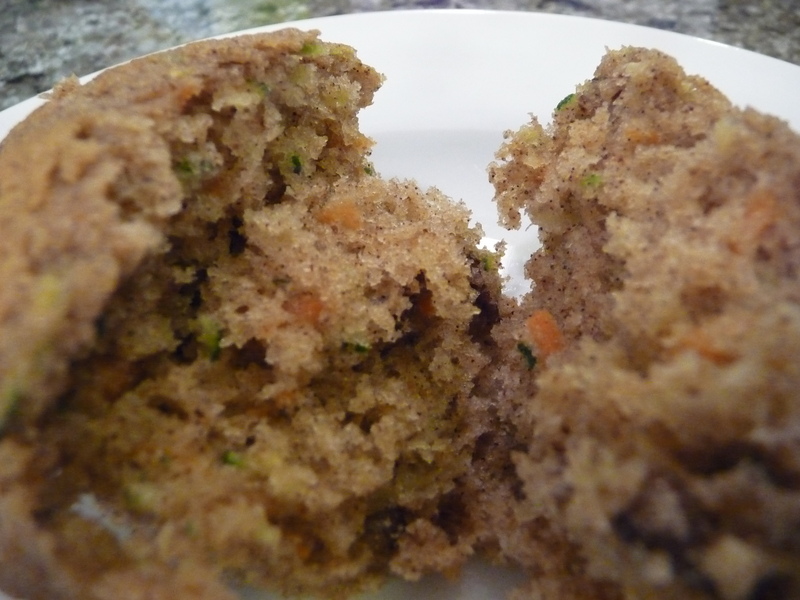 Quinoa flour can be found at some supermarkets and at natural foods stores aka Whole Foods. -Arrange racks in upper and lower thirds of oven and preheat to 350°. Line 2 large baking sheets with parchment paper. Whisk both flours, 3/4 cup sugar, baking powder, and salt in a large bowl. Add cranberries and crystallized ginger and toss to coat. Add spices. -Combine 1 cup cream, buttermilk, and zest in a medium bowl. 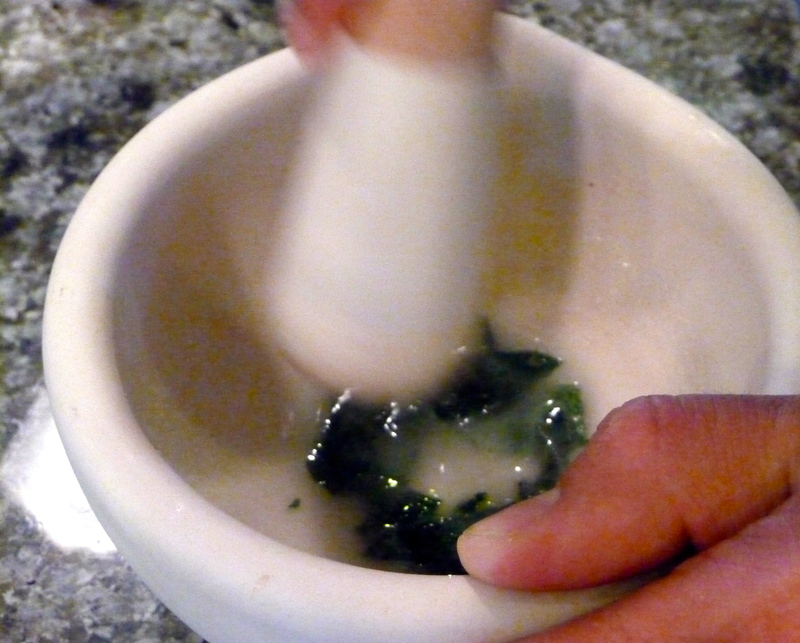 Pour cream mixture into dry ingredients; stir until partially combined. -Scrape mixture onto a lightly floured surface. 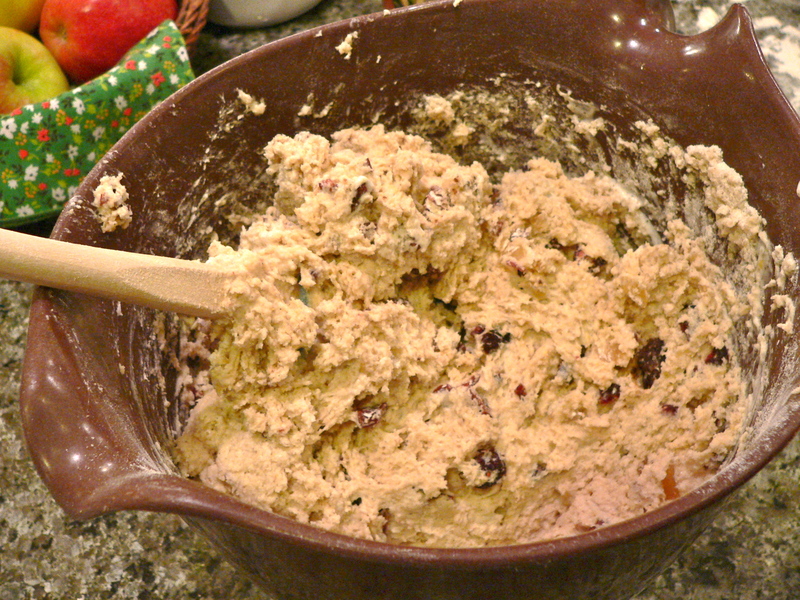 Knead with lightly floured hands until dough forms, 4–6 turns (dough will be slightly sticky). Form into a 10×5 1/2×1-inch rectangle. Cut lengthwise in half. Cut each half into 8 squares. Cut each square in half diagonally for 32 small triangles. -Bake scones, rotating sheets halfway through, until tops are golden brown and give just slightly in the center when pressed, 30–35 minutes. Let cool on sheet on a wire rack. Do ahead: Can be made 8 hours ahead. Store airtight at room temperature. It’s not a hard thing to do. 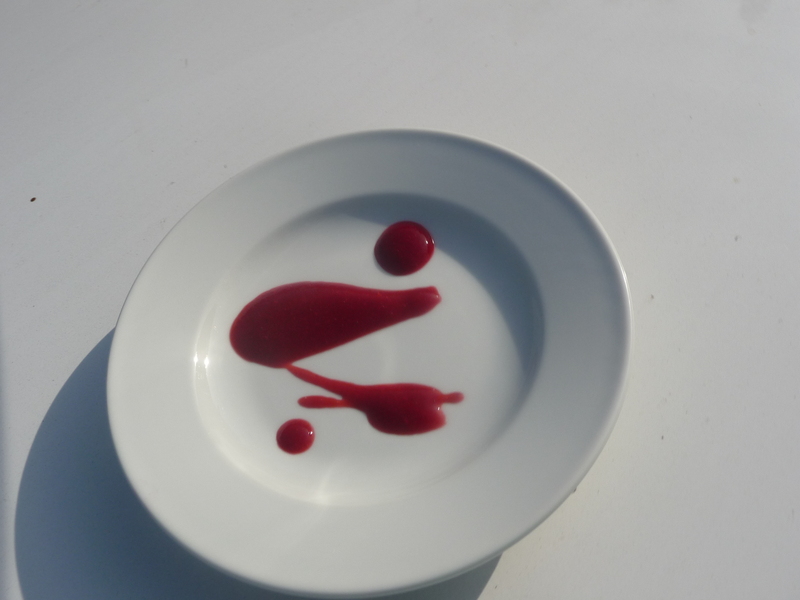 It’s not a souffle, a foam, or a gastrique. Pilgrims, Julia Child and Norma Lyon (I’m assuming) have done it. 3rd graders churn it on their annual field trip to the “farm”. Or at least, I did. It was part of an introduce the “Anglenos to bovine creatures” experiment. They attempt to repeat this every year at the L.A. County Fair. 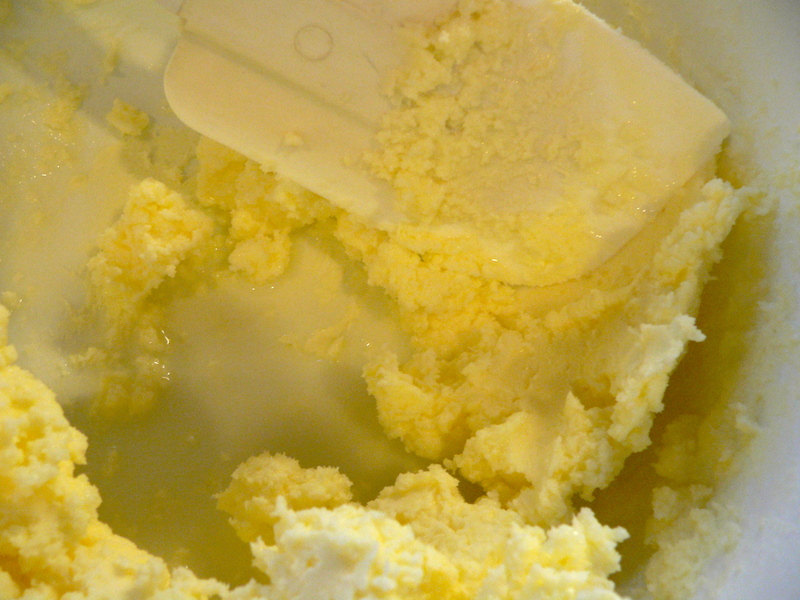 Recently, my mom made butter from scratch. She went to a cooking class with her friend and brought back two logs of sweet butter. I started drooling. Then she went and got bread. Glorious bread from Il Fornaio. Perfect bread, crusty on the outside, chewy on the inside. Absolutely delicious plain, just as a slice of bread. But then we added the sweet butter. I have been fortunate enough to eat great food. Food that makes you shut up and savor. Food that transports you somewhere awesome. I definitely haven’t eaten it all yet. I have a list of great restaurants to try and wonderful countries to visit that is a mile long. That said, I have yet to find a taste experience that beats wonderful bread with fresh butter. It’s both simple and revolutionary, comforting and magical. It’s perfection in a bite. It’s breakfast, lunch, a snack, dinner. It’s dessert. -Put the cream in the bowl of a food processor. Process the cream until the butter begins to separate from the buttermilk and the butterfat granules are about half the size of a pea. This will take a couple minutes, it has to get past the “whipped cream” stage. 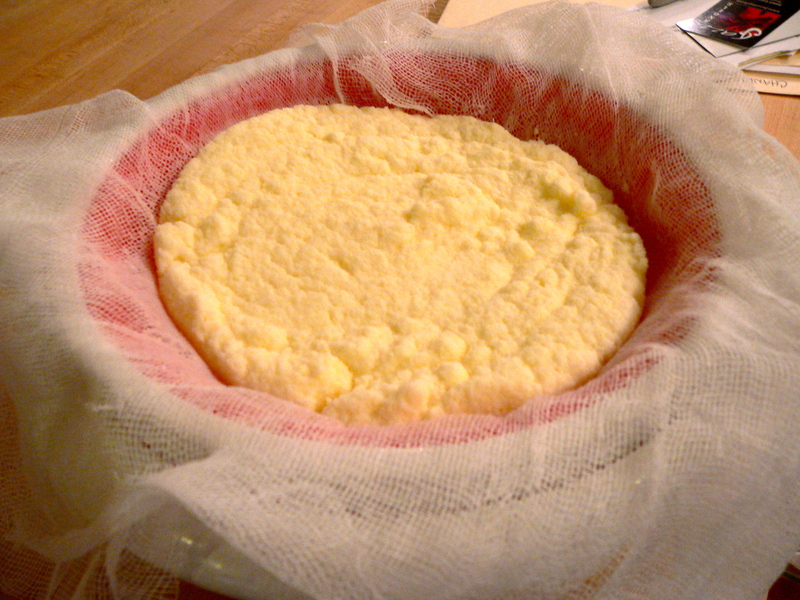 -Grab the ends of the cheesecloth together and squeeze, pushing downward to extract as much additional buttermilk as possible; then unwrap the butter solids from the cheesecloth. -Rinse the butter under cool running water, carefully kneading and folding the mass onto itself until the water runs clear. This is super important so your butter won’t have buttermilk run-off. -Place the butter in a dry bowl and sprinkle with salt (see #5) (optional, I understand if you’re trying to watch the sodium intake). Using a firm spatula, repeatedly smear the butter against the side of the bowl to incorporate the salt and air. Pour off any additional liquid. -Transfer the butter onto a piece of wax paper or plastic wrap and form it into a smooth-sided block or log. Refridge overnight before you use it. Your (homemade!!) 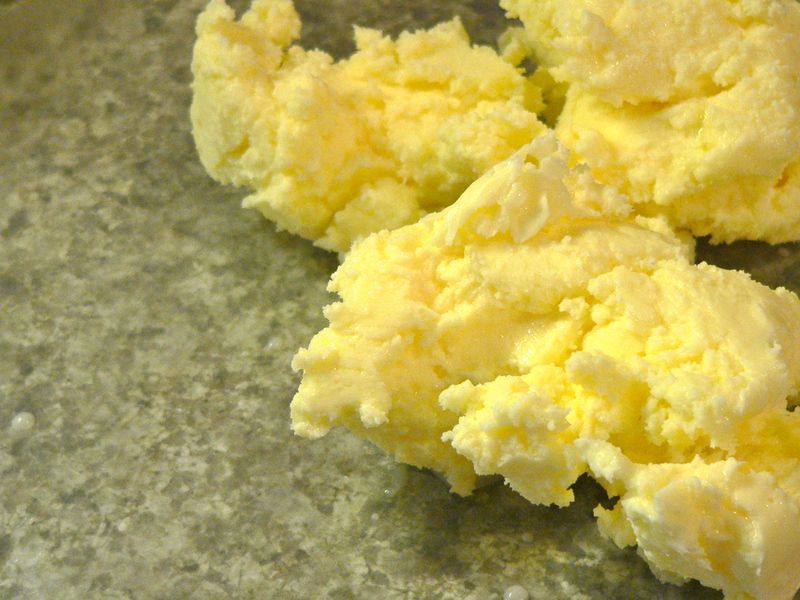 butter will keep for three weeks in the fridge or three months in the freezer.